Boca Raton FC opened its first NPSL Sunshine Conference season with a 1-0 loss at Ted Hendricks Stadium against Miami United FC, the reigning champions of the conference. Daniel Navarro’s sixth minute goal held up for the home side despite an excellent second half from Boca Raton FC. Leonardo Tavares made several outstanding saves particularly in the early going to keep Boca Raton within touching distance of Miami United. The home side continued to pile on the pressure in the first fifteen minutes but then the match settled into a rhythm which was more favorable to Boca Raton. The visiting side earned its first corner when captain Bruno Militz drove toward the byline in minute 25. Even though the resulting corner was cleared by Miami United, it allowed Boca Raton to finish the first half with more confidence, as the midfield began to keep possession more easily alleviating the intense pressure that the back four had experienced in the first fifteen minutes of the match. Ukrainian International Edmar was particularly influential in this period linking passes well from a withdrawn midfield role. Coming out of the locker room, Boca Raton created several chances early in the second half. In minute 47, Bernardo Gomes found John Contreras behind Miami United’s backline for the first Boca Raton scoring opportunity of the half. Minutes later Bernardo took a free kick which ended up going just wide of the near post. For the first fifteen minutes of the second half, Boca Raton built up aggressively from the back, breaking down Miami United’s midfield and benefiting from precision balls played by Bernardo and Edmar to the feet of Militz and Contreras. Militz proved a handful for Miami United’s defense for much of the second half, finding pockets of space and exploiting it in a way to help stimulate Boca Raton’s attack. Boca Raton continued to create opportunities but Miami United’s defense did just enough to deny a goal. Miami United’s back four was tested in the second half particularly by Militz movement on the left flank and by the combination play of Gomes and Justin Wilbanks toward the right side. 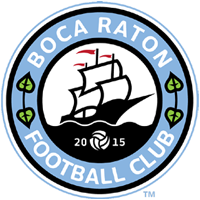 In the end however, Boca Raton could not find an equalizer though the performance demonstrated a statement of intent as the club has joined the NPSL Sunshine Conference this season. These same two teams will meet at the same venue in US Open Cup First Round play on May 10. “We feel good about our performance particularly in the second half when we kept the ball well and were dangerous going forward. It was neat to play in front of such a good crowd with a great atmosphere tonight, and we look forward to playing in front of our fans in the next game” said Militz. Boca Raton plays its first home NPSL match at the Shipyard on May 12 against Kraze United. Tickets are on sale here.